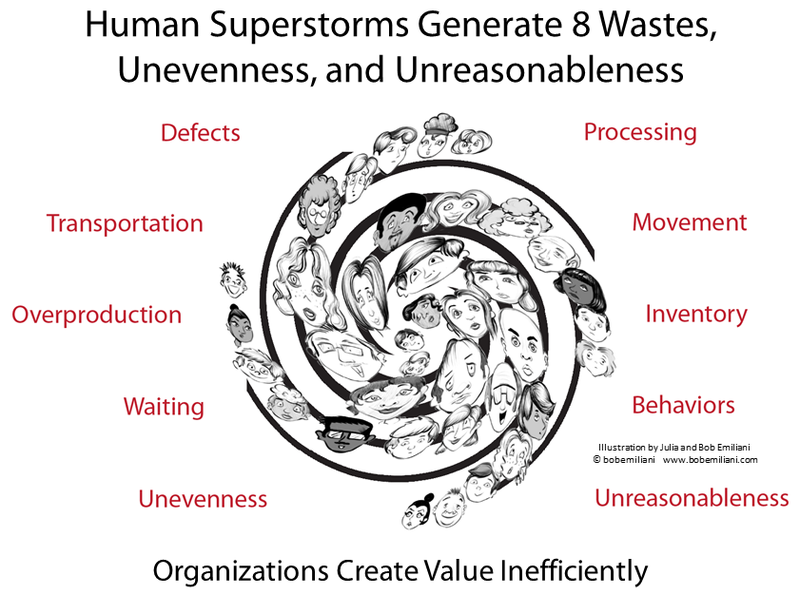 The eight wastes – overproduction, waiting, transportation, processing, inventory, movement, defects, behaviors – plus unevenness and unreasonableness. Where do they come from? Are they naturally occurring phenomena? No. They come from people. Waste, unevenness and unreasonableness are the product of how people conceptualize, design, and execute work processes, human imperfections, how people lead others in hierarchical organizations, shortcomings in knowledge, experience, and understanding, and so on. We hate the eight wastes, plus unevenness and unreasonableness, but they are us. 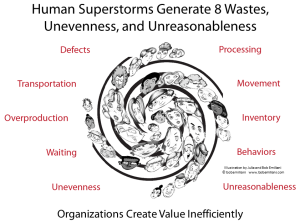 I find it helpful to think of the the eight wastes, plus unevenness and unreasonableness, as a superstorm that destroys value, people, and relationships. But, unlike natural superstorms such as Sandy, we can actually control our man-made superstorms if we can acknowledge their existence and learn how to apply Lean principles, methods, and tools to reduce and eliminate them. Doing so helps us create value for customers more efficiently and effectively, which, in turn, helps organizations achieve stable long-term growth and mutual prosperity. The human superstorm makes life at work more complex and more difficult than it has to be. The human energy that goes into creating and managing superstorms could be better used to calm the superstorm and improve daily life at work. But, of course, we need leaders to help calm the superstorm. Too many leaders think the superstorm is the normal condition. It is abnormal, and the leaders who recognize that are the ones to learn from.